Mobile payments dominate the conversation about retailers and small businesses today, but dual-purpose cash and check scanners still play an important role in how companies conduct their operations. In fact, Forbes cited a 2015 study conducted by payments company Blackhawk Network that found cash and checks are still the preferred transaction method for today's consumers. More specifically, 93 percent of survey respondents reported having paid with cash over the 12 months prior. Checks and debit cards tied for second place at 68 percent. More recently, many small- to medium-sized businesses across a wide array of industries have begun preparing to accept mobile payments in response to rapidly changing consumer behaviors. In fact, eMarketer shared data that found mobile payments will grow from $8.71 billion in 2015 to $27.05 billion by the end of 2016. While this is clearly massive growth businesses should be aware of, it certainly does not mean digital and plastic payment methods will replace the more traditional cash and check options. The fact of the matter is businesses will continue to accept cash and checks throughout the next decade. Among a vast array of operational requirements that come with running a business is the task of check and currency handling. These two responsibilities are traditionally managed as separate functions that require different, specifically trained personnel, explicit attention to detail, designation workplaces and, of course, time. Processing checks and cash is an important function that is prone to error and often robs managers of time they could be spending training employees, engaging with customers, developing business strategies and promote long-term growth. 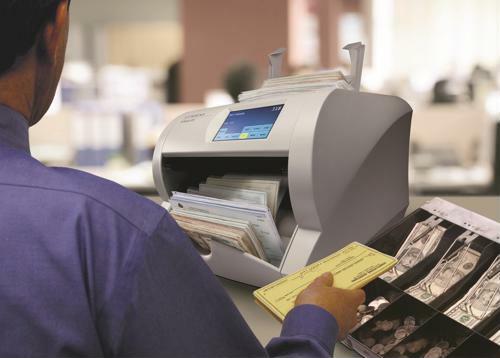 Dual-purpose cash and check scanners process cash and checks simultaneously and send the data directly to a business's financial institution. Additionally, these machines keep photo-enforced records of each deposit, which business owners can use to manage their expenses and more effectively analyze their profits. Additionally, dual-purpose cash and check scanners are equipped with advanced counterfeit detection capabilities, which keep businesses safe from fraud and help prevent fake money from making its way further into the U.S. economy. Today, the most successful businesses are prepared to adopt the latest technology and stay ahead of the curve. This means offering customers mobile payment options, using advanced marketing tactics and streamlining important operations such as cash and check processing. With the right tools, companies of all sizes can ensure long-term success.